Ralph: The Roadhouse family had given us several recommendations for things to do in Chicago. Millennium Park sounded like a great destination, and we were interested in breakfasting at the little Greek diner they told us about. But when we woke up on Tuesday (waking late from our late night), we could just tell that making plans was just not going to work out. Sometimes in such situations, we struggle to make plans work anyway - but we were on vacation and we still had flexibility, so we decided to just bob on the waves and let things happen. 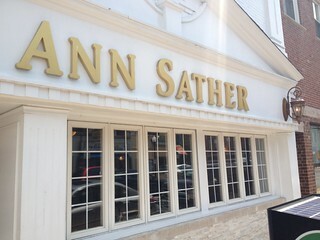 For brunch, we went to Ann Sather's in the Swedish neighborhood of Andersonville, after a phone call determined that they weren't picky about breakfast hours. 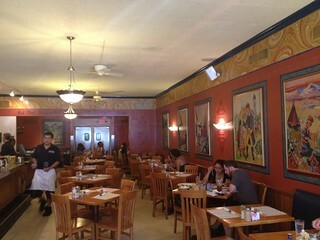 Ann Sather's was a lovely place, with a clear Swedish touch in the fairytale paintings on the walls. Our waiter was incredibly flirtatious. 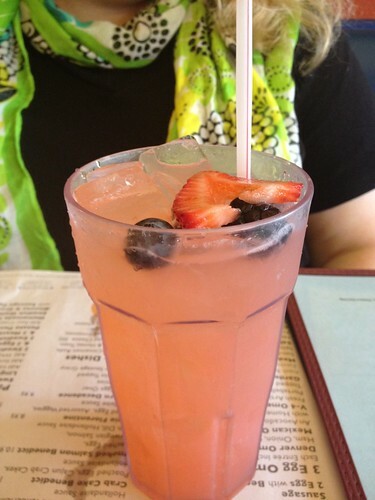 As he delivered Lori's berry lemonade, he said to her, "If we had any vodka, I'd push him out of the chair for a cocktail with you." 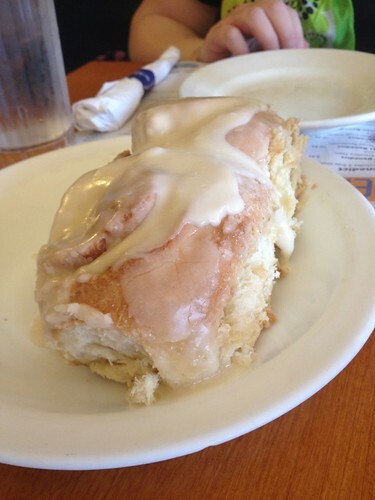 For an appetizer, we shared a light, fluffy cinnamon roll. 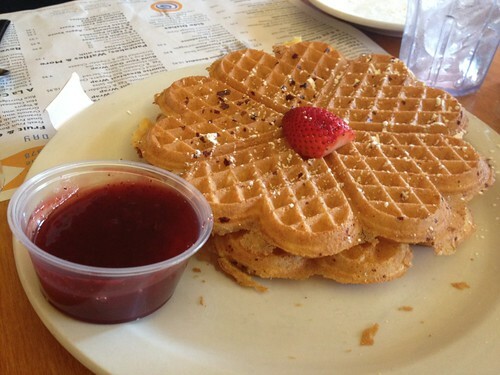 Lori's waffles were light, crisp, and delicious. I chose the Swedish sampler. 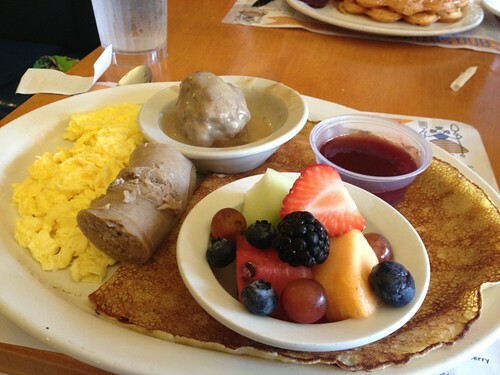 The Swedish potato sausage was good, but extraordinary, as was the broad, thin pancake. But the real winner was the Swedish meatball. My previous experience with Swedish meatballs has mostly been from IKEA, where it's almost true that even the meatballs are assembled with Allen wrenches. But this meatball was super savory, with a rich combination of herbs. This was one of the highlights of the trip. 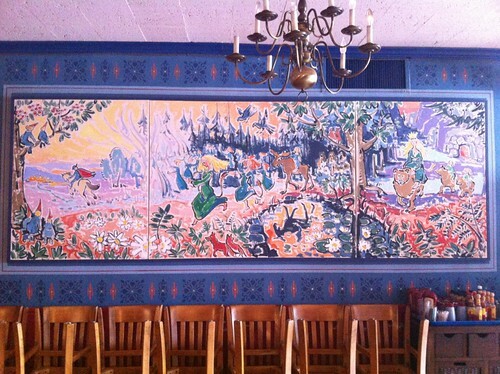 Ann Sathers' upstairs room was painted with a different set of scenes. 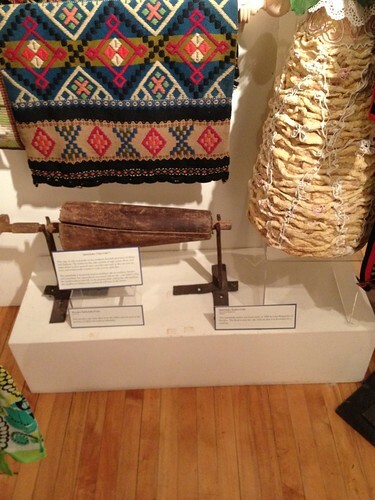 This is a device is a mold for making conical cakes next to a fire. 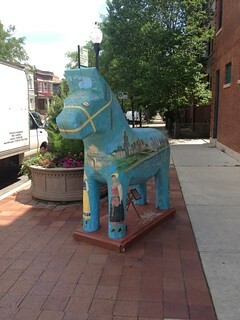 This horse near the museum is a Dala Horse, a traditional Swedish symbol. 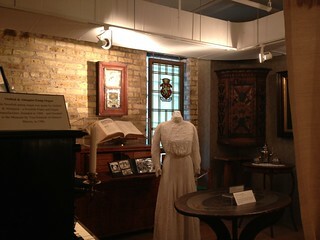 This one had first lived in Sweden and had been moved to Chicago. After the museum and a stop in a nearby feminist bookstore (I wish that we had a nearby bookstore with notes on the shelves featuring commentary from the staff), we felt ready to leave Chicago - we had entertained hopes of doing more things in Chicago, but the heat and the difficulty of parking made us ready to leave earlier. We started to get a little appetite as we drove south toward I-80, and looked for a Roadfood place to eat. 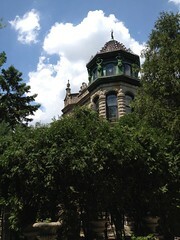 Lori located a place that appealed to us, so we pulled off of the interstate to reroute. 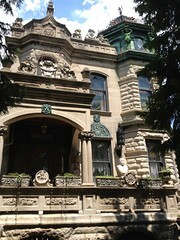 It turned out that that place was on the north side of Chicago, a long stretch of rush-hour traffic away. 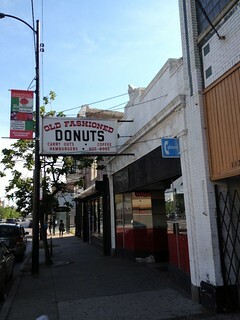 So we looked closer, and found Old Fashioned Donuts. I inquired about the Texas donut on the menu, and was told that it was a big donut, and would be another fifteen minutes before it was ready. I didn't intend to order the Texas donut, but it may be said that I knew that it my inquiry had been interpreted as an order for a Texas donut and I did not try to stop it. 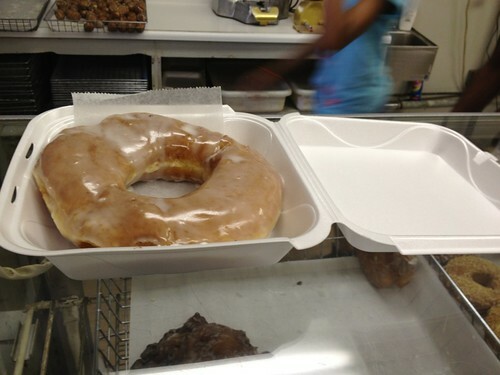 This is the donut I received. We named it Tex. There's a reason that Old Fashioned Donuts states that the styrofoam containers are normally $0.25, but free when the Texas donuts are ready. 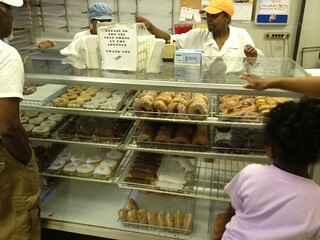 The saleswoman told us how the hot sugar glaze would soak into the donut over a few minutes of standing. It was not actually a great donut - or rather it was, but only in size. It was very greasy, soaked with grease as well as sugar glaze. We ate less than a third of it. We hoped to find some indigent person who would find the calories worth the risk of diabetes to give it to, but we failed to do so and ended up discarding it. 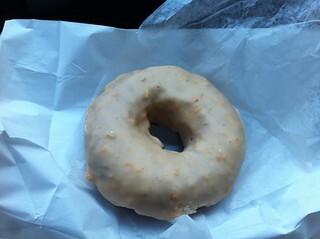 Lori's orange-glazed buttermilk donut was much better. 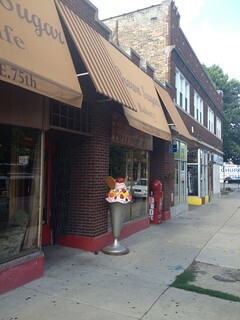 The donut, then, reminded Lori of Brown Sugar Bakery, which she had visited during the Chicago-Milwaukee Roadfood tour. 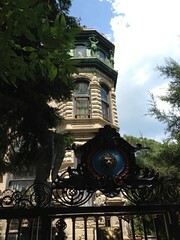 I remembered that it was across the street from Lem's, and we discovered that Lem's was only five minutes' drive away. We had a fun chat with Stephanie, the proprietor. I particularly remember her description of the Obama cake: "It's like America: black and white and red inside, with plenty of nuts." 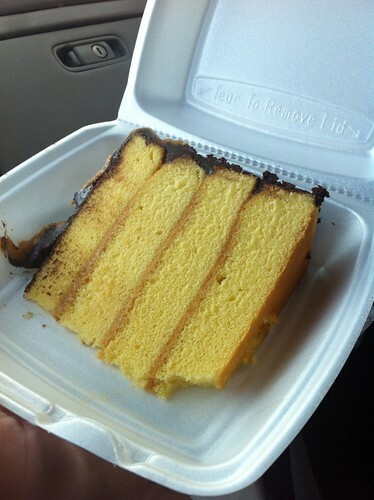 Lori chose a slice of yellow cake with caramel frosting and a drizzle of chocolate ganache, which she describes as "just delicious". We left Chicago at last and drove for a few hours through Illinois farmland. We eventually stopped for dinner at a restaurant just off I-80 called the Big Apple Family Restaurant. Everything was quite mediocre and hardly worth describing. 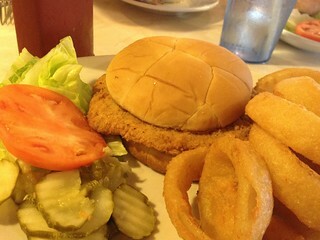 The one item of any interest was the breaded pork tenderloin sandwich I ordered. This did not live up to my expectations of a broad, thin pork tenderloin that surpassed the bun; this was a bland, ignorable sandwich, such as you'd get if Chick-Fil-A were named Pork-Fil-A. A noteworthy breaded pork tenderloin could only be better.